This may not look like much of a sandwich, but I promise you, once it is stacked with your faves, you will love it. This is my version of the vegetarians ultimate sandwich, using similar ingredients that you would use to make a tuna sandwich. Use your favourite bread and toppings. I added sliced cucumber and sliced dill pickle. You can also add lettuce leaves, or tomato slices. All good, all delicious! 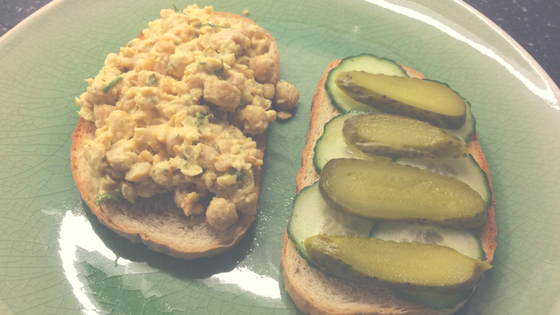 Mash the chickpeas in a mixing bowl, stir in all the ingredients and make your sandwich. Seriously, it is that easy!